Hiked through the Gap of Dunloe today. We started at Kate Kearney's Cottage and walked past a string of mountain lakes to the Head of Gap (the mountain pass at the head of the valley drained by the River Loe). From there, a gentle descent brought us to the floor of the Black Valley where we picked up the Kerry Way heading for Lord Brandon's Cottage where we had lunch. Then we boarded a small open boat for a trip across the Lakes Of Killarney--Loch Uachtarach, Loch Mhucrois, and Loch Lein. 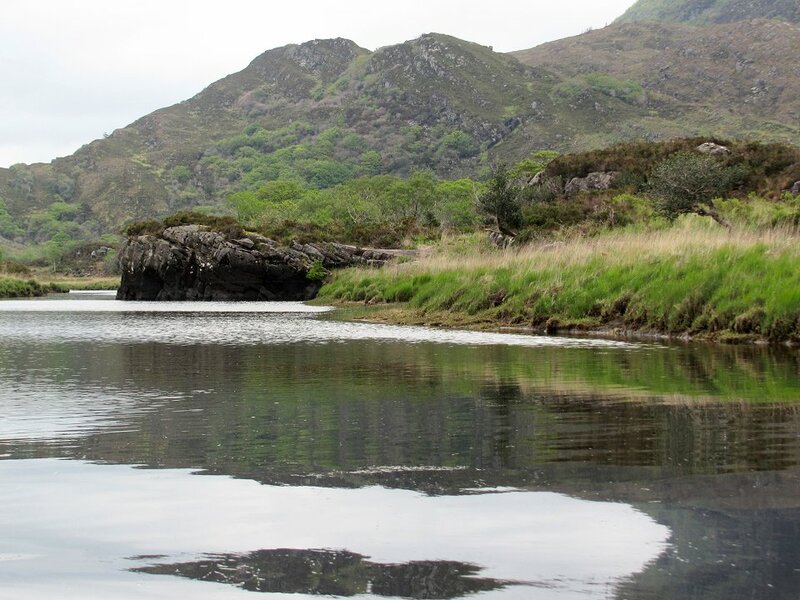 This photo was shot after we left Loch Uachtarach ("Upper Lake") and were cruising on the Long Range River on the way to the Meeting of the Waters. The slopes of Torc Mountain rise in the background.